Use this search field to search Blatherings archives, or go back to the Main Blatherings page. ***Please note: You are browsing Debbie's personal blog. For her kidlit/YA writing & illustrating blog, see Inkygirl.com. 1997 - 1998 - 1999 - 2000 - 2001 - 2002 - 2003 - 2004 - 2005 - 2006 - 2007 - 2008 - 2009 - 2010+ (current archives). My friend Craig and I were trying to decide where to eat yesterday; we decided to look for something in the CAD$25 range, and I wanted something unusual. Like me, Craig's an adventurous eater, willing to try almost anything. We ended up choosing Pomegranate restaurant (420 College St. (at Bathurst), Toronto, ON 416-921-7557, Map) because of this Toronto Life review. I've never tried traditional Persian cuisine, and the unusual-sounding ingredients intrigued me. Doogh, a tangy yogurt drink. The restaurant was full when we arrived; the only space available was a small raised alcove in the back that the hostess called a "takht" (a Persian double bed), just big enough for two people along with their dinner; you take off your shoes and sit crossed-legged or lounge against the pillows as you eat. 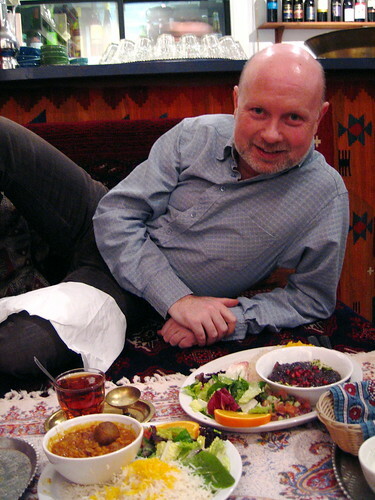 Craig and I were delighted; we couldn't have asked for a more exotic dinner setting! The hostess said most diners tended to opt for regular tables, so was relieved that we didn't mind. 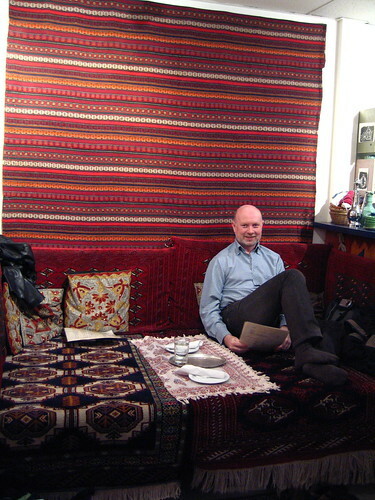 Craig and I both agreed that when we come here again, we'd purposely reserve the takht. 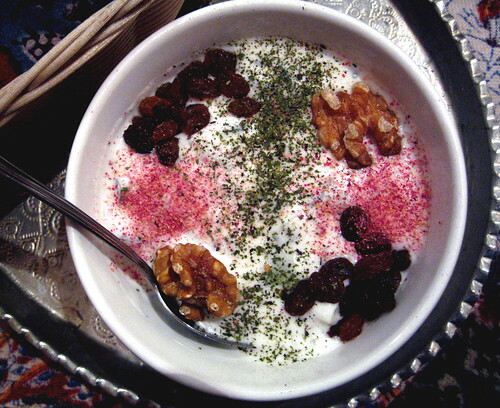 We ordered an appetizer called maast-o khiar for $3.75 (see above), a blend of English cucumber, walnuts, raisins and rose petals in a rich creamy herbed yogurt. It came with a warm Barbary flatbread. For our main courses, we ordered queymeh and fesenjaan. 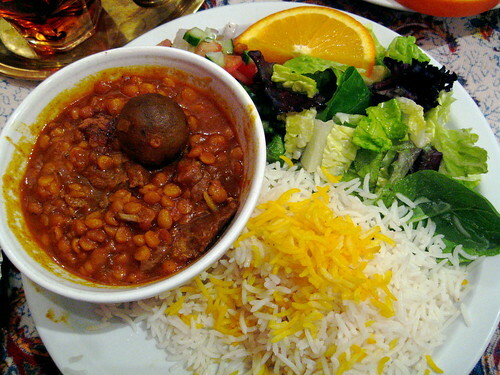 Above: The queymeh was a tomato-based tangy stew of yellow split peas, lamb chunks and dried lime topped with cinnamon. CAD$10.95. The round ball on top was the lime, I think; we ate the whole thing, peel and all. Yum. 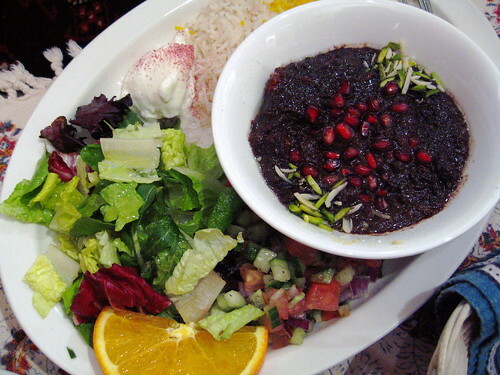 Above: fesenjaan -- a smooth rich stew of ground walnut and pomegranate syrup served beside a plate of saffron basmati rice, creamy yogurt and salad. We ordered the chicken version instead of the vegetarian version. CAD$13.95. EVERYTHING was very good, and I would definitely come back here. There are so many things I still want to try! 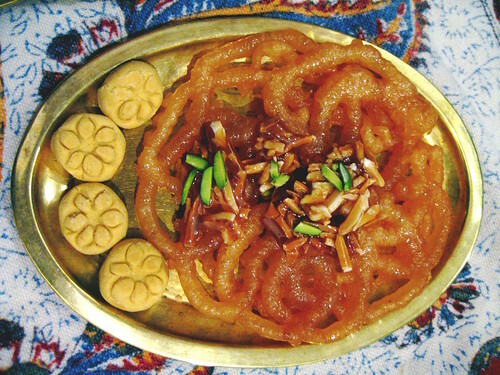 Like the kashk-e bademjaan appetizer, which is charred eggplant, persian whey, garlic and walnuts topped with crispy onion. And a main course called aloo gheysi, which consists of bokhara plums and dried apricots in a saffron sauce with boneless chicken pieces served with creamy yogurt. And morasa polo: jewelled rice - slivers of seville orange peel, almond and pistachio with diced carrots and barberries blended in saffron basmati rice served with a braised lamb shank, creamy yogurt and salad. Above: For dessert, we opted for a dessert tray which included honey-soaked, deep-fried pastry and chickpea cookies. The pastry was a yummy sticky-sweet concoction topped with slivered almonds and something else I can't recall. I wasn't so crazy about the cookies, which seemed relatively tasteless (at least in comparison to everything else). Next time I think I'd like to try the saffron-rosewater ice cream. 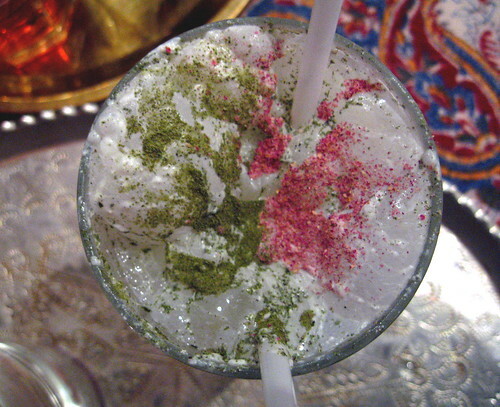 After an appetizer, doogh drink, two Persian teas, two main courses and a dessert, the total bill came out to less than $45 for two people. I highly recommend this restaurant to anyone looking for good food in an unusual setting. Reservations highly recommended, and be sure to ask for the takht in the back!